Sharing is caring: Hoang Duc Huy, the establisher of www.english4all.vn and mastermind behind the Help to Fly Project. Teacher Hoang Duc Huy is passionate about bringing English to disadvantaged areas. He started the Help to Fly Project and created a website with free English lessons for all ages. Thuy An reports. The success of English as a global language has been attributed to many things: its versatility, empire, globalisation, MTV, the internet, Hollywood. Viet Nam's Hoang Duc Huy, however, would attribute the popularity of English to its inherent appeal. But then again, learning and teaching English is his passion - as is London, judging from the website he established to promote English learning, which features images of a red London double-decker bus, an Underground sign, a black cab, and of course, Big Ben. His website www.english4all.vn offers interesting English lessons for people of all ages and abilities for free in the hope that they will, as his website says, "Learn it. Live it. Love it". Huy, who was born in 1988 into a family with a love of learning, attended the Foreign Language Department at Hai Phong University before pursuing a master's degree in management at London Metropolitan Business School. 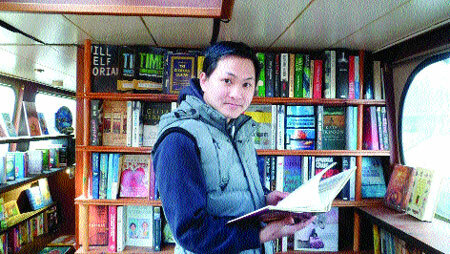 On why he decided to devote his time to promoting English for free in Viet Nam, he said on his website that "while most people do things for profit" he was driven to meet the needs of those who have a "thirst for knowledge" but who may not have the time or means to formally learn English. "There is a kind of happiness called sharing," his website said, urging others to "join us in continuing the lessons that we were taught in school". Officially established on June 1, 2014, English4ALL does not teach English in the traditional way we learn at school. Instead, the website discusses English terms to do with words such as bread, honeymoon and newspaper, which makes learning easier, more practical and fun. The English4ALL logo was inspired by the disc-like symbol of the 150-year-old London Underground mass-transit system, affectionately, or sometimes not so affectionately, referred to as the Tube, which he uses as a metaphor to describe travelling to new learning horizons. The website is very much a calling for Huy. "I sometimes wish that I did not have to do anything else, and that I could devote all my time to English4ALL. However, besides managing the page, I still have to work and attend school," Huy said. English4ALL is open to everyone who has access to a computer and the internet. But for the disadvantaged and children with HIV, English4ALL and Hai Phong University's Foreign Language Department launched the "Help to Fly" charity project in Ngoc Son Fishers' Village and the Thanh Xuan Centre in the northern province of Hai Phong. The project is supported by a number of volunteers from the Foreign Language Department, as well as Huy's university friend, Pham Thi Men, who is an English lecturer at the university. "We are all teachers, so we choose the way to light up the future of our country by teaching with all our hearts," says Huy in a message to members of the project.